I just noticed that this is our 102nd post, this is so exciting. I feel that you are all such a big part of my life. If you are new to this blog and would like to read more about how it works you can go HERE and it will explain what this blog is about. Each week we get a few new people who share their hearts with us, we hope that you will continue to do so. As more and more people are linking up with us it may take longer to read every one's post. Well let me rephrase that it may take me longer to read them all Charlotte is much better at this than I am, thank-you Charlotte. I do get to every one's post but it may take me up until Sunday night or Monday morning to read them all. I hope that everyone has a wonderful and safe weekend. Thank you ladies for starting this site. It is uplifting each weekend. I feel that I have made online friends. Congratulations this is such a blessing each weekend and a wonderful group! Thanks for hosting and blessing us with your time and love. It's a day only post...so lively. of last week. I'm sorry Ginger, I'm like you at a loss for words when expressing sorrow but you did fine and still visited rather than run away. Bless your weekend! I think we are glad whenever anyone visits! Yes, I agree its a challenge to read all the posts. It takes days! But what a blessing it is. God bless you all and thank you sisters Charlotte and Ginger for hosting this special, warm place. Love that picture, Ginger. Have a wonderful weekend. used this same photo.I called the posting God Smiled. What a wonderful pic! Schedule my post again this week. We will be driving to tennessee within the hour. Going to spread some of daddys ashes in the smokey mountains....would ask for prayer this week. I know it will be hard but I pray healing as well! Thank you ladies for this blog! It blesses me so very much....to post and to read others posts! I look forward to Spiritual Sundays each week. God bless you ladies. Thank you ladies for this beautiful place sharing God's grace and goodness. It has been a place of enocouragement and growth for me and I am so thankful I came across it! I was so blessed by so many of you who came and lifted my spirit last week! Difficult to share...difficult to read... difficult to comment but you did and I appreciate your love & words! May my link today lift you as you lifted me! Thanks! God is smiling in the sky!!!! I love that chapel in Sedona. It is such a peaceful, spiritual place. Thanks for hosting Spiritual Sundays. Thank you ladies for hosting. =) Off to church but I will be on later to catch up with more posts! 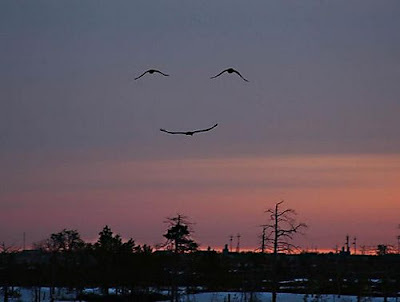 Love the smiley face birds! Wishing all of you a blessed Sunday, I hope to take some time after church to read all the posts! Good morning! I posted a blog this morning ( Sunday march 14th, onto my blogsite at http://www.karensthreadsofhope.blogspot.com .. I don't know much about the permalink stuff, so I need help to know if I will be included.. I did type in my name/url thing.. just don't know what it means to do the rest.. Looking forward to reading all the posts today, from my reclining chair! I have pneumonia right now, so worship time for me, is in my chair! And thankful my Jesus meets with me here, still in my jammies! I love that photo! Thanks for this site and hosting. I'm not a participant this weekend, but always enjoy visiting those who gather here. Hubby and I have been in beautiful Arizona since the first week of March. We're in Williams, currently. Taking a train to the Grand Canyon tomorrow. Haven't seen it in winter. Looking forward to glimpsing God's magnificent handiwork. Blessings to you ladies, and everyone who visits your blog each week. Thank you for the encouraging words and blessings received. Thanks for hosting and blessing us with your time and love.